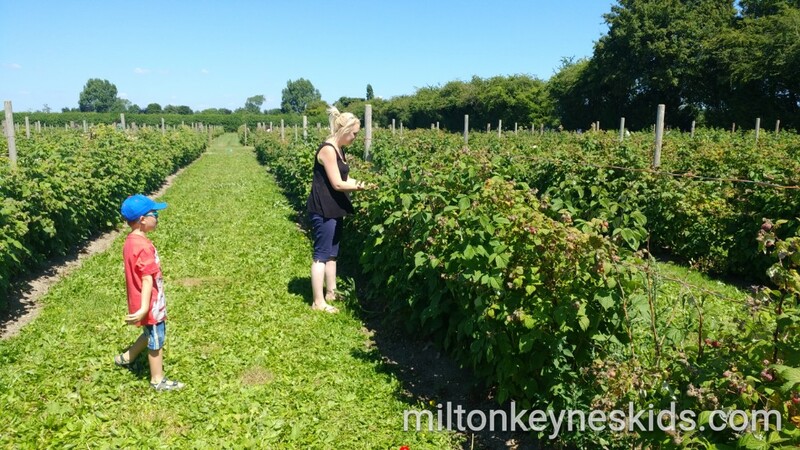 We returned to Grove Farm – Pick Your Own in Bedfordshire in June 2018 in search of fruit we could pick. We have been once before but went right at the end of the season in 2017 so it was only vegetables that were available. You can read all about our previous visit here where you can see what it’s like to go in October and how the weather affected our visit. However this year we went on a very hot day and the video below gives you an idea of what to expect in the summer months. Where is Grove Farm Pick Your Own? Grove Farm Pick Your Own is in Great Gap in Bedfordshire. 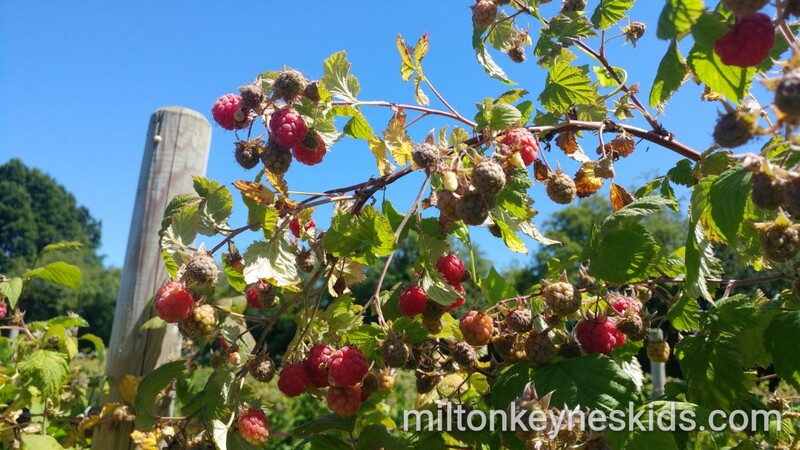 It’s about 30 minutes from where we live in Milton Keynes. The postcode is LU7 9DZ. At the time we visited we had to go via Ivinghoe to avoid road diversions. 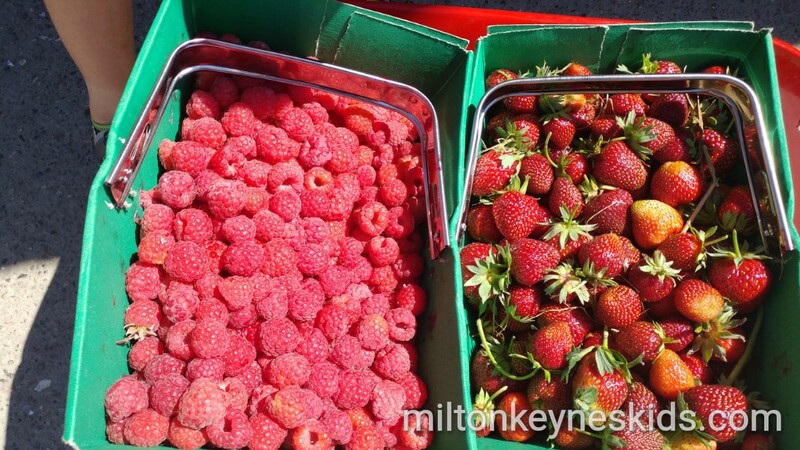 What is Grove Farm Pick Your Own? Grove Farm is a place where you can go to pick your own fruit and vegetables. 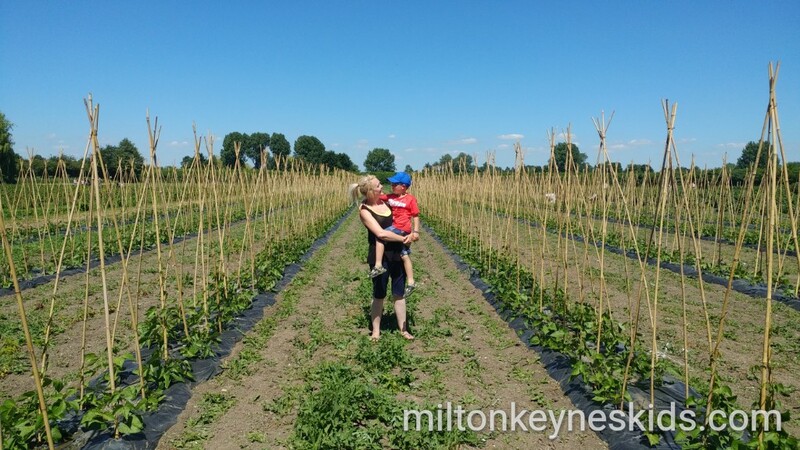 It’s not open all year round – it’s approximately June to October and depending on when you visit, as well as how busy it’s been, will affect what kind of fruit and vegetables are available and how much of them are in stock. 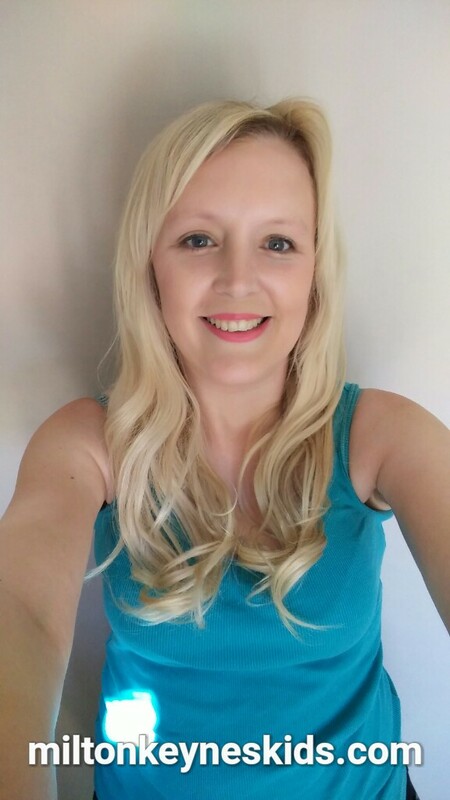 The best thing to do is to check what’s available on their website before travelling so you have an idea of what to expect so you’re not disappointed when you get there and are wanting to pick something in particular. 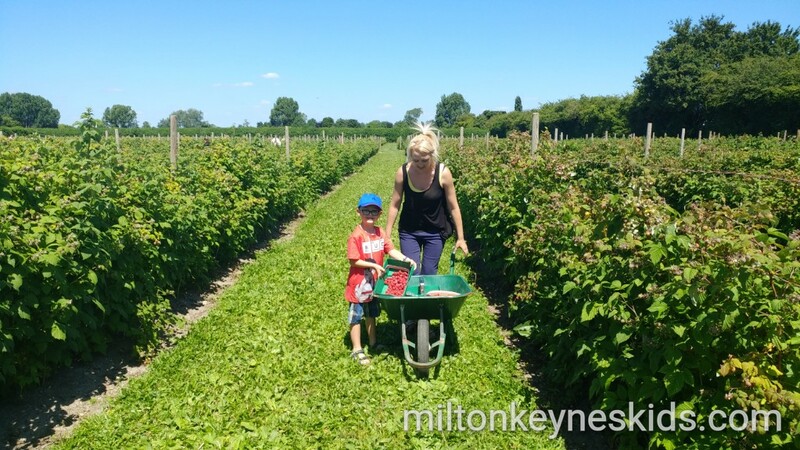 What is Grove Farm Pick Your Own like? It’s a good sized fruit and vegetable farm set against a beautiful backdrop of Ivinghoe Beacon. It’s free to park and when we visited we parked easily. The farm provides large wheelbarrows which you can use to collect all of your fruit and veg in. You don’t have to take your own punnets either as they are provided. 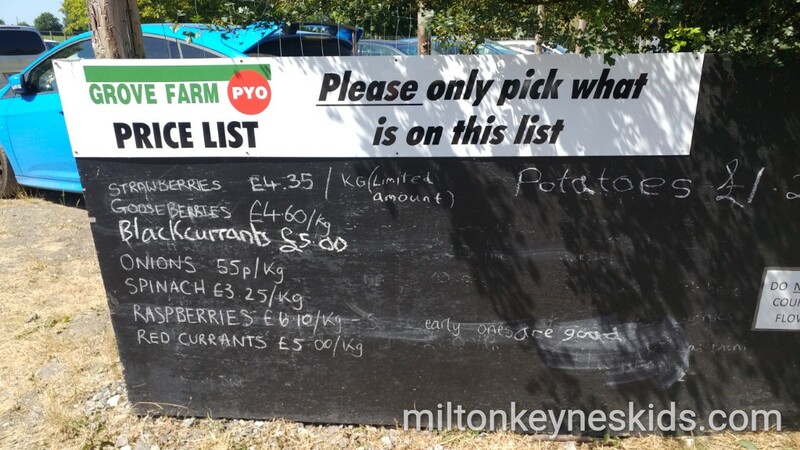 You then walk around at your leisure filling up your punnets or barrow with whatever you want to purchase at the end. My boys – who were five and almost three when we visited – quite enjoyed sitting in the wheelbarrow – they were quite heavy though so I don’t advise lifting similar aged children for very long! If you go in the height of summer then do make sure you put on lots of sun cream and hats as it is exposed and there is little shade. Do take lots of water with you, although a few refreshments including ice-cream are available to buy. 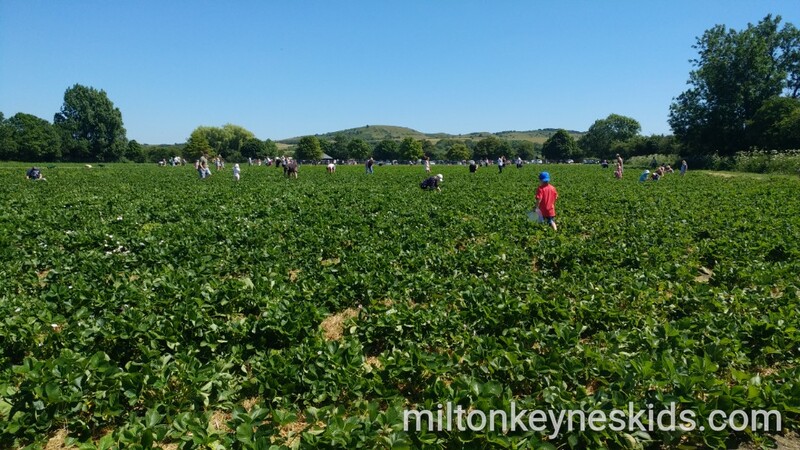 Unlike some pick your own places, the fruit and veg picking is the only activity, there is no play area or lots of seating. How much does a visit to Grove Farm Pick Your Own cost? Entrance is free and parking is free. You just pay for what you pick. I wouldn’t say it’s somewhere to go if you’re thinking you’re going to get really cheap fruit and vegetables – the prices we paid for the strawberries and raspberries were less than the supermarket – but not by much. You really are going for the experience of doing it yourself. My sons both did really enjoy it – we were there somewhere between 2 and 3 hours. What tips do you have for visiting Grove Farm? If you’re reading this in 2018 it’s too late for strawberries – in fact when we visited we really had to hunt for them. If you’re reading this in the years that follow then definitely go when the strawberries are first available or are plentiful. What I would say though is even without the strawberries then there’s still lots of fun to be had. If you have a child like my youngest son who is very independent and likes to do everything by himself, then perhaps consider taking a child’s wheelbarrow with you – he had great fun wheeling his own around. There are several portable toilets on site which were fine, although once you’re well into the fields it can take a good few minutes to walk back to them if you have young children. Also check the opening hours on their website before you travel – at the time we visited they were closed on Sunday afternoons. We’re travelling some distance to Grove Farm what else can we do in the area? If you go via Ivinghoe then there’s a good park which you will see in your way that you could stop off at. Other places within a short distance but I haven’t blogged about are Ivinghoe Beacon and the Ashridge Estate if you fancy going for a walk. Dunstable Downs is also a short distance away.